They number more than one million people in Canada, proudly embrace this country’s diversity and democratic freedoms, and are one of the most observant and fastest-growing religious groups. Now Muslims in Canada have a stamp that recognizes two of their faith’s most important festivals, Eid al-Fitr and Eid al-Adha. Canada Post issued the stamp today, together with members of the Muslim communities in Montréal and in Richmond Hill, Ont., north of Toronto. 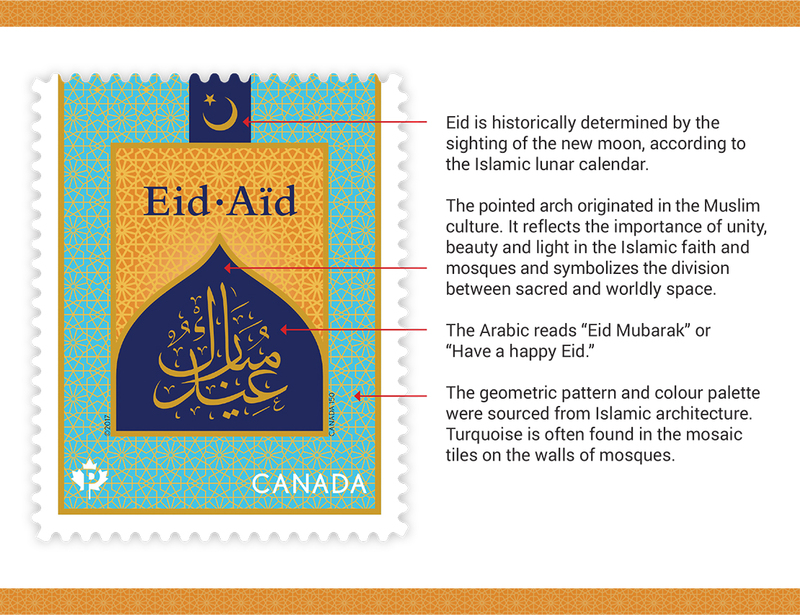 The Eid stamp is one of three new religious stamps Canada Post will issue this year, which reflects our pride in Canada being a land of diverse faiths, customs and celebrations. Earlier this year, Canada Post and India Post agreed on a historic joint stamp issue featuring two stamps marking Diwali, the Hindu festival of lights. One stamp from each country will be released on the same day in the fall of 2017. Canada Post had also announced earlier that it will issue a Hanukkah stamp this year, recognizing the Jewish faith’s eight-day celebration in December. The new religious stamps build on the longstanding tradition of issuing Christmas stamps. Canada Post has issued annual Christmas stamps since 1964. In recent years, one Christmas stamp has depicted a sacred image reflecting the Christian faith, and another reflects a secular holiday theme. Eid al-Fitr marks the end of Ramadan, the month in which Muslims fast from dawn until dusk – one of the most distinctive practices of Islam. Eid al-Fitr, or the Festival of the Breaking of the Fast, falls on the first day of the tenth month of the Islamic calendar, Shawwal (around June 26, 2017, in Canada). The stamp is being issued a month ahead of Eid al-Fitr. On the day of Eid, many Muslims congregate in mosques or in open spaces, where they will perform a special ritual prayer prescribed for Eid. People dress in their finest clothes, decorate their homes with lights, give treats to children, and visit with friends and family. With Eid al-Adha, or the Festival of Sacrifice, Muslims commemorate Abraham’s willingness to sacrifice his son as an act of obedience to God. The festival also marks the end of the annual Hajj pilgrimage to the Kaaba in Mecca, Saudi Arabia, the holiest site in Islam. It falls on the tenth day of the twelfth month of the Islamic calendar, Dhul Hijjah (around September 2, 2017, depending on when the new moon is seen). Like Eid al-Fitr, this celebration can include special ritual prayers, lavish meals, and visits with friends and family. It also includes gift-giving and acts of charity. The Arabic script on the stamp reads “Eid Mubarak,” which translates to “Have a happy Eid” or “Have a blessed Eid.” It appears under a pointed arch, which symbolizes the division between sacred and worldly space in Muslim culture. The stamp’s deep blues and warm gold and yellows, as well as its geometric pattern, are seen in Islamic architecture. The new moon atop the stamp signifies the start of Eid. The population of Muslims in Canada passed the one million mark in 2011, and has reached more than 3 per cent of the total population. Many have arrived in Canada in the last decade, while most Canadian-born Muslims are second-generation Canadians. Despite many Muslims being relative newcomers, a 2016 study found they stand out as being among the most enthusiastic groups of Canadians when it comes to patriotism. More than eight in 10 said they are very proud to be Canadian. They are also as likely as others in Canada to say their Canadian identity is very important. They agree with other Canadians, too, on what makes Canada a great country: its freedoms, its democracy and its diversity. The study, entitled Survey of Muslims in Canada 2016, was the work of the Environics Institute, the Canadian Race Relations Foundation, charitable organizations and other partners. The survey, conducted over the winter, found that Muslims agree with many of their fellow Canadians on what they dislike, too – at least several weeks into that time of year: Canada’s cold climate.